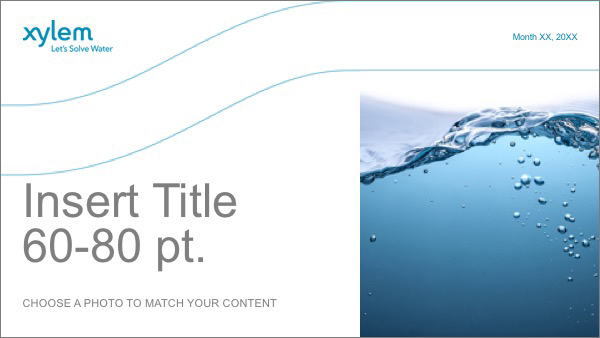 Powerpoint Template | Xylem Inc.
How Do We Solve Water? 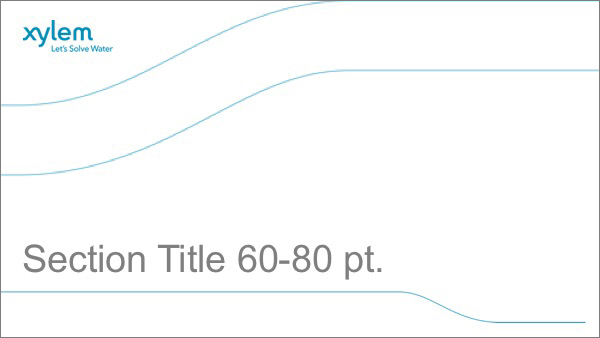 Onscreen presentations, such as PowerPoint, are a critical brand touchpoint. They are one of the most common forms of business communication today. 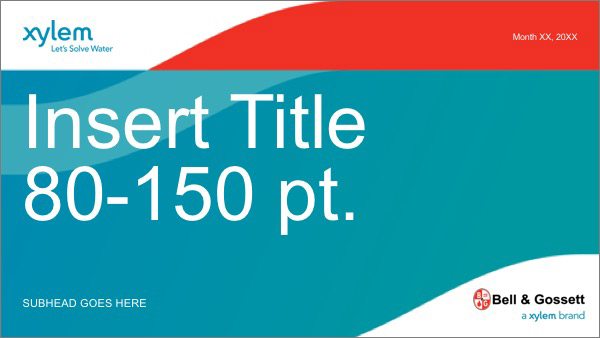 Unfortunately, when PowerPoint templates are modified unnecessarily, brands often suffer. The fonts, colors, chart styles and other elements have been carefully crafted to work together within the presentation as well as across a variety of brand touchpoints. Please do not modify this template. 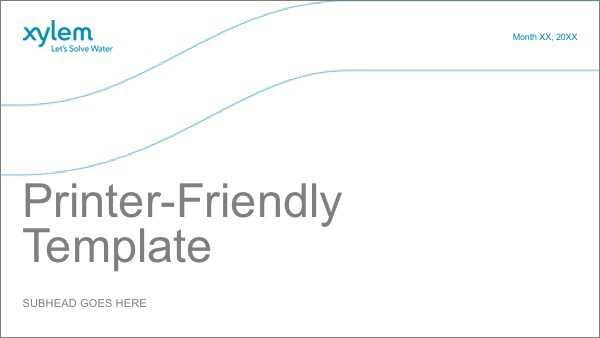 There are several slide options in the template. 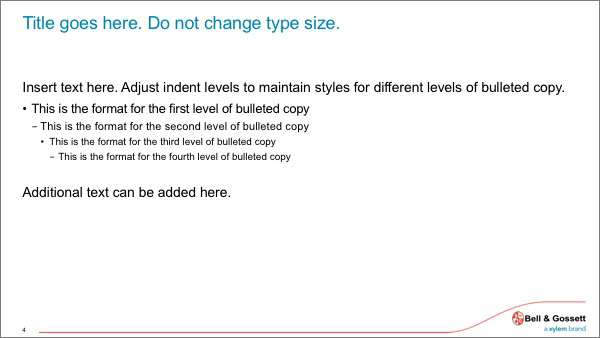 Multiple color options are provided for each type of slide (title, divider, content, etc.). When creating a presentation, be conscious of using these color themes coherently. 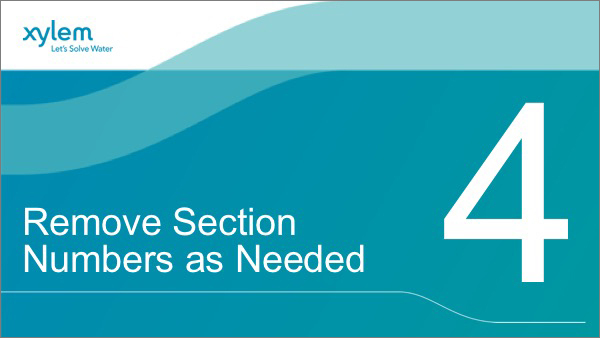 Keep to one color theme throughout a major section or entire presentation. 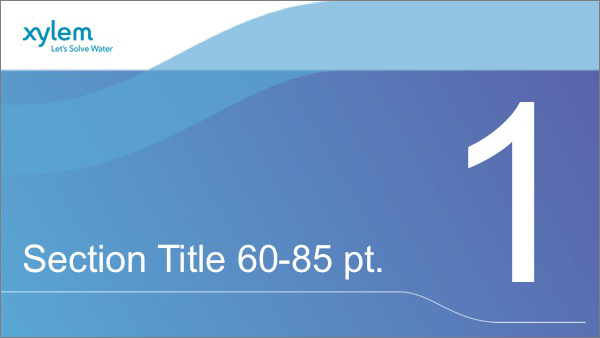 It may be necessary to provide hard copies of a presentation. 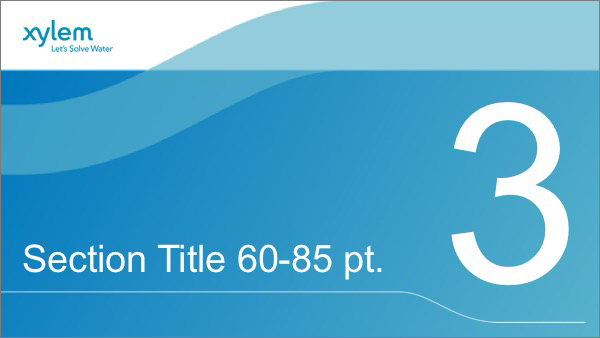 In order to conserve resources and provide legible documentation of a presentation, use the following slides to produce printer-friendly materials. 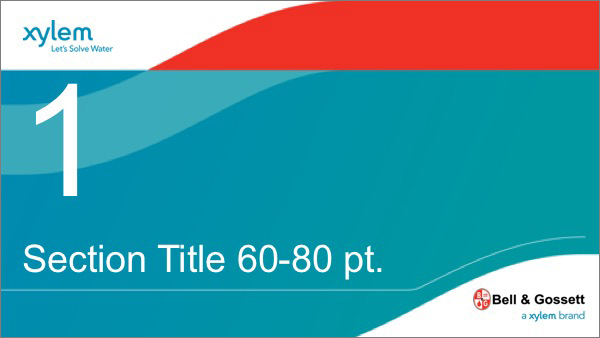 Please also use this template for internal presentations. 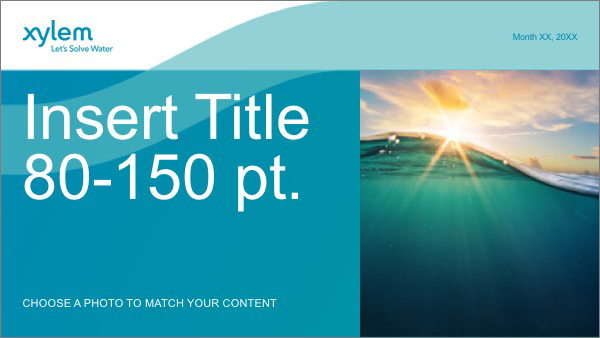 Title slides provide options with or without photos. 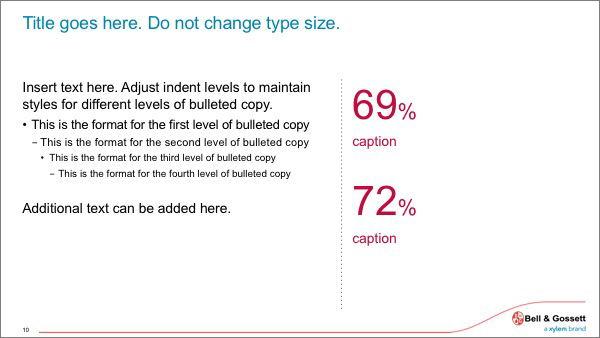 Choose the one that will be most compatible with the content of your presentation. 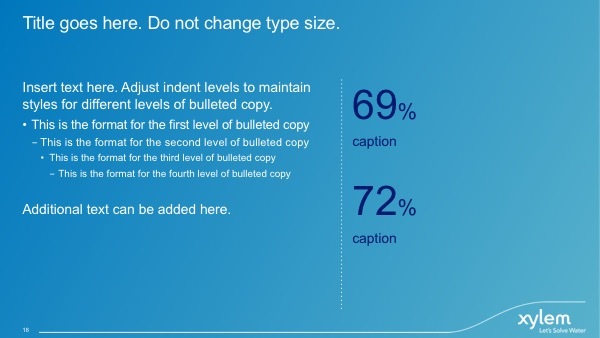 Content may vary greatly from one PowerPoint presentation to the next. 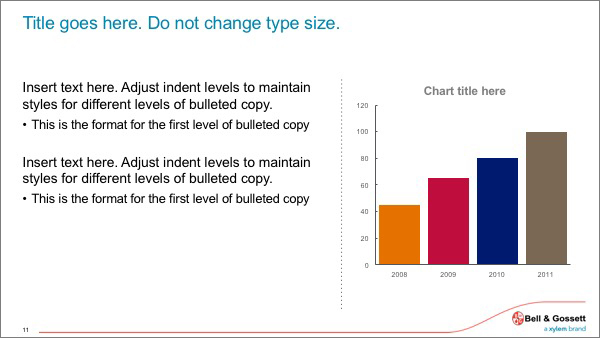 Choose the content slides that will be most compatible with the type of information you are presenting. Be sure to follow the guidelines established under Imagery & Photography when choosing graphics. Limit use of accent colors to charts and callouts (see Color Palette). 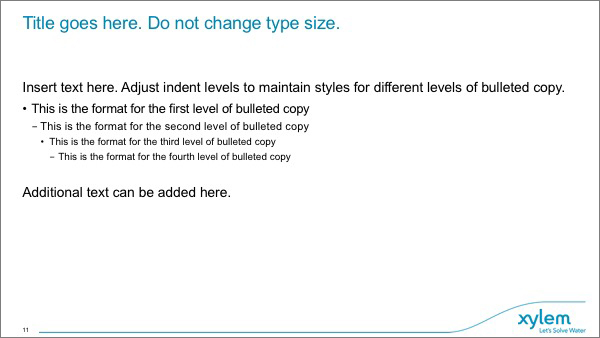 The single largest offender of good design in PowerPoint slides is text. 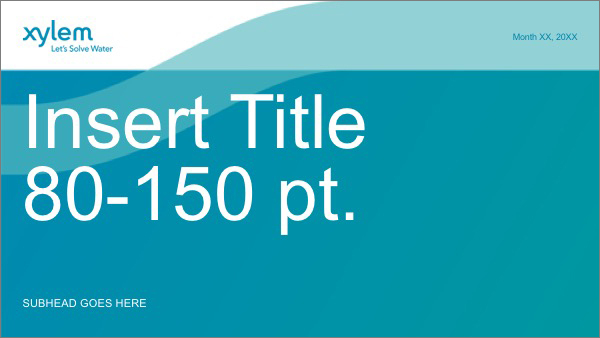 PowerPoint is intended to be a presentation medium. 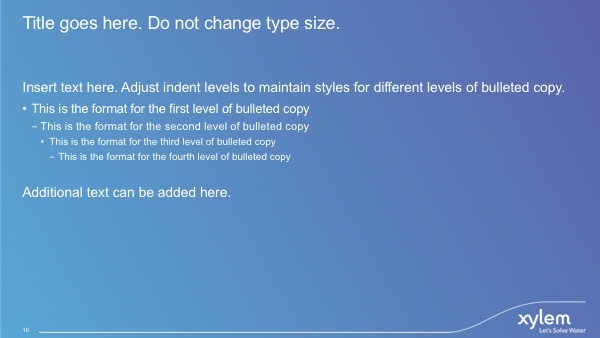 Do not use type smaller than 18 pt, which is the smallest that can be seen from the back of an average-size conference room. 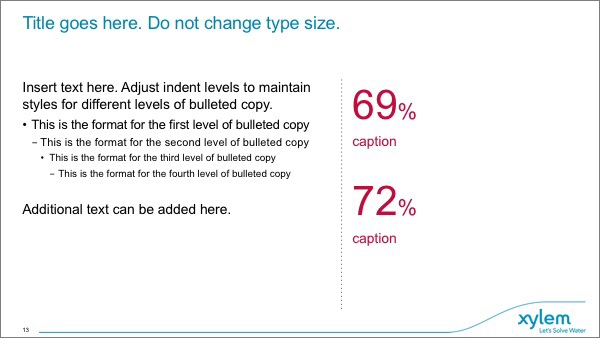 Do not have more than 6 bullet points, and not more than 6 words per bullet. 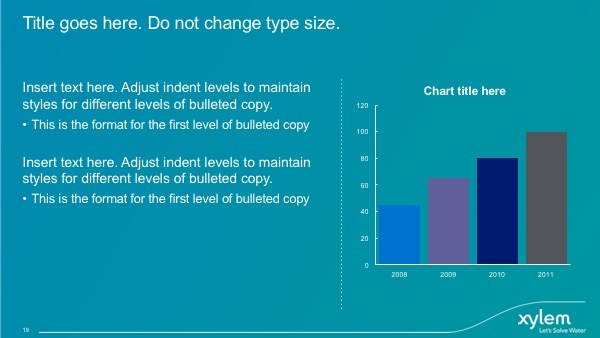 Do not clutter charts with so much small type that you have to say, “I know you can’t see this, but…” If your audience cannot see it, you should not show it. 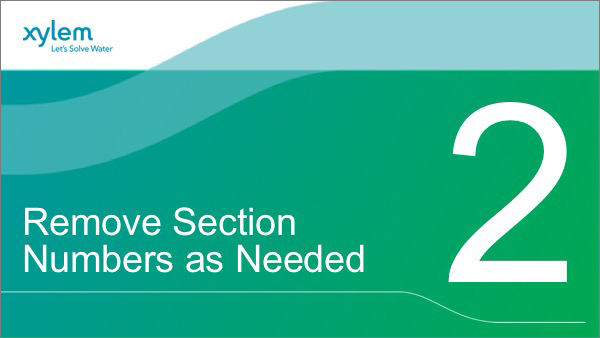 Divider pages are supplied in different color themes. Separate templates have been provided for many product brands (see the downloads for list of available brands). The slide layouts have been adapted to accommodate a product brand lockup and colors. All remaining graphics remain the same as the corporate template. For support and technical questions, please contact us.